Tommaso di Giovanni di Simone Cassai was a renowned Florentine painter during the 15th-century. The influence of his art during the Early Italian Renaissance period continued on even after his death in 1428, influencing a lot of his contemporaries as well as future artists. He is remembered as one of the founders of Renaissance art as well as one of the most renowned Old Masters during that period, along with Filippo Brunelleschi, an Old Master who was the architect of the Florence Cathedral’s dome, and Donatello, the Florentine sculpture who created David out of bronze. Together, these three were the first champions of Quattrocento, which is another name to refer to the art during the period of Early Renaissance in Italy. Giovanni was born at Castel San Giovanni, now known as San Giovanni Valdarno, in the Tuscan Province, in Italy, to a father, Ser Giovanni do Mone Cassai, who worked as a notary. His mother, Mona Jacopa di Martinozzo, was an innkeeper’s daughter from another town. Masaccio, as he was called, also had a brother named ‘Giovanni’, also an artist that went by the nickname Io Scheggia. None of Masaccio’s and Giovanni’s ancestors were artists, so historians would remark how odd it was that the brothers chose to be artists when during the 1400s it was usually a custom to take the same profession as your father’s. Historians guessed that maybe it was through their grandfather’s acquaintances that they learned how to paint. The life he lived between his birth in 1401 until January of 1422 remains a mystery. There are no records of what his early life was like or who and where he trained to learn painting. The detail about his grandfather’s acquaintances being his source of knowledge and training were just guesses. His grandfather was a chest maker, and chests at the time were usually painted on. Many were certain, though, that he definitely learned painting from another artist and that he was taken as an apprentice. As of today. no one knows who his master was or other details, like if his master had a studio or not. By 1422 he was painting on his own. The altarpiece, Madonna, and Child with Two Angels and Four Saints, painted that year were one of his earliest known surviving works. It was a collaboration work between him, his brother Masaccio, and Andrea di Giusto, who was a Florentine painter during that era. 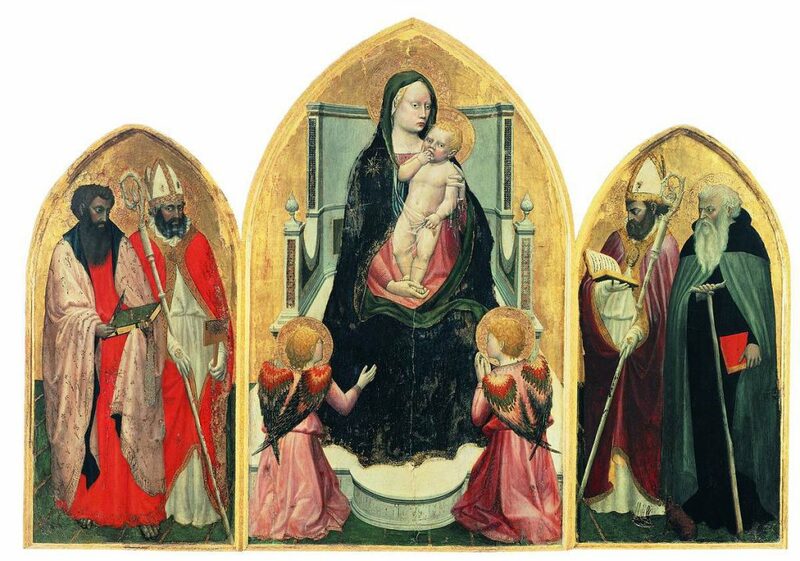 On the same year, Massacio painted the San Giovenale Triptych, said to have even pre-dated the altarpiece. In 1424, he painted the Uffizi Madonna and Child with St Anne with the help of Masolino. 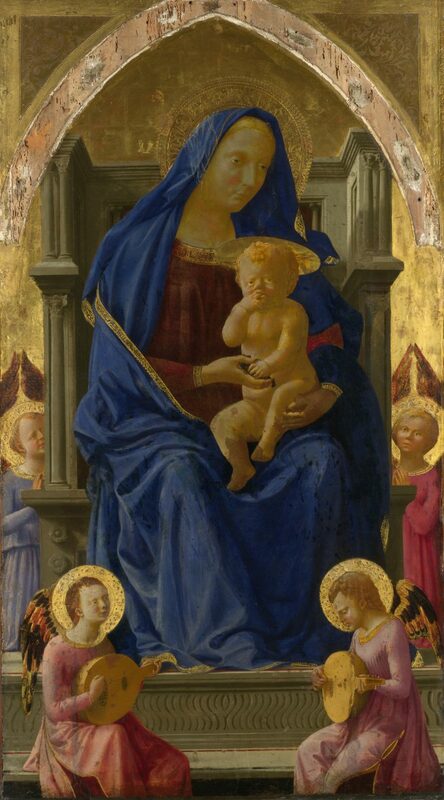 In this collaboration, Masolino painted St Anne and all the angels in the painting, except that one angel in the middle on the right, which Masaccio painted along with the Virgin and the Child. He had a lot of other works before he left for Rome and died there in 1428. There’s the Expulsion of Adam and Eve, the Pisa Altarpiece, The Tribute Money, and the Trinity. Masaccio’s life was pretty short. He was only 27 during the year he died. Nonetheless, he made a huge impact with his art that forever influenced Renaissance artists: Andrea del Castagno, for example, whose art matured by taking the naturalism and humanistic aspects of Masaccio’s works and absorbing it. Seventy five years later, Leonardo da Vinci, Raphael, and Michelangelo were taking inspiration from the art of Masaccio. He never had any pupils, nor did he have his own workshop. But his art was good enough to impress even the best Renaissance artists of his time, helping shape the course of the greatest artistic period in history.